The quick and easy solution to organize your garage, attic, basement - anywhere you have wood joists or rafters. 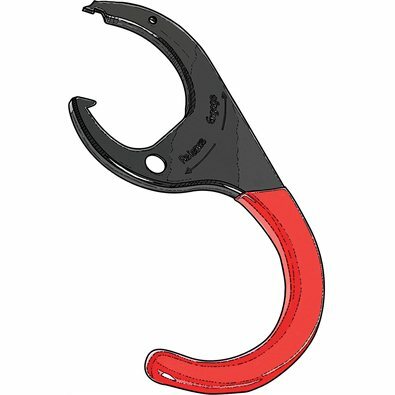 These steel hooks have rubberized plastic dipped handles to enable you to easily hook or release them. No fasteners or tools required! Great for hanging bicycles, garden tools, hoses, extension cords, cans of paint, lawn chairs, baskets, holiday decorations, fishing gear, pool equipment, luggage, toys - the applications are endless. Hang a closet rod with two hangers and you have an instant closet. We have heard that this also works as a tool to unlock horizontal exterior vinyl or aluminum siding. Durable Black powder coated finish for indoor or outdoor use. Quantity discounts. The more you buy, the more you save. These joist hangers are awesome! Easy to use and hold a lot of weight. Perfect for storing things overhead without having to affix a permanent hanger/hook on your rafters. So glad I was able to find this product on your website. Simple little 'grabbers' and perfect to hang things from wood I-beam joist where you're not supposed to screw anything into them. These are nicely engineered and made in America. Be careful when you take an item off the hook, as you can knock the hook off completely. That is good, because you can easily reposition them. Every winter I struggle to figure out what to do with the outdoor furniture. The chairs don't stack and take up way more space than I have in the shed. Now they hang from the shed rafters with Lumb-R-Grip joist hangers and all my lawn gear is still accessible underneath. They hold a lot of weight and have never let go. A good tool for using available space. Use this product in the attic to hang my light so I can see & also to hang my xmas decorations. Also use them in the laundry room to hang clothes that I don't put in the dryer. Works great!!!! Use them every day. Lumb-R- grips are a must in your workshop/garage..